The Meiningen Hofkapellmeister Johann Ludwig Bach is one of the members of the widely ramified family of musicians who did not pay much attention to secular fame and contented themselves with leading a secluded and industrious life, so that they quickly tended to sink into obscurity. That was perhaps why, as early as 1754, Carl Philipp Emanuel Bach pleaded that those relatives not be forgotten: "It would be impossible to understand why such good men are so little known beyond their fatherland unless one remembers that those honest Thuringians were so satisfied with their fatherland and their situation that they did not even want to venture far beyond the same to seek their fortune elsewhere. 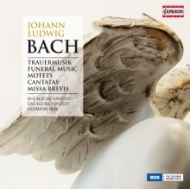 Very little of Johann Ludwig Bach’s presumably quite extensive musical oeuvre has survived – just under two dozen sacred cantatas, about a dozen motets, a mass, a large funeral composition, a secular homage and an instrumental work of doubtful authenticity. 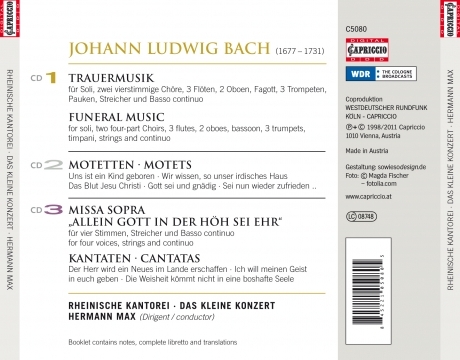 The cantatas in particular have drawn the attention of scholars, since no fewer than eighteen of them have come down to us via Johann Sebastian Bach, who performed them in 1726, his third year of office as Thomaskantor in Leipzig.